Guada is very proud and he does everything he can to be noticed both on and off-stage. Guadalevin, or “Guada” for short, is a gorgeous Lusitano stallion performing in our latest production Odysseo. He may be a newer member of the 65 breathtaking 4-legged performers that make up the Cavalia cast, but he makes his presence felt. On average, horses are fully mature by the age of 5. So that means, Guada, at 8-years-old, is in his performing prime! 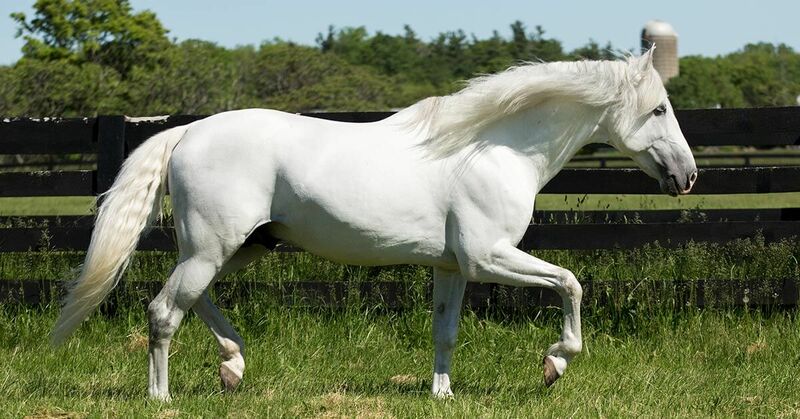 Because Guadalevin is a stallion he is feisty and full of energy which is a great thing as he performs in three acts in Odysseo: “The Travelers”, “The Great Adventure” and the Odysseo finale. This studly stallion is trained in Dressage and loves to show it off. Dressage is an intricate equestrian art form – a sight to be seen when perfected. Yet, it doesn’t compare to watching 16 Cavalia horses and riders perform it together on stage during “The Travelers”. All will agree, the experience is out-of-this-world! Guadalevin can be seen in several Odysseo acts strutting his stuff. In “The Travelers” Guada and his rider, Camille, are one of 16 horse-rider duos who appear on stage. As a group, the horses cross the stage, giving an impression of traveling through distant lands. Once in the center of the expansive stage, the horses begin to ride in more intricate patterns that change direction and size in perfect symmetry. Eventually the horses seamlessly merge into a giant pinwheel formation spanning the entire stage, and their movements create a kaleidoscope of movement and color. Aside from the beauty of just watching dressage, there is another magical side to it. Like other horses who perform dressage, the idea that Guada has such a connection with his rider, is something special. Regardless of the fact they speak different languages and don’t resemble one another, they communicate efficiently. Dressage is a dance between the rider and horse that is above all reliant on trust and respect. Being proficient in dressage means that Guada can read Camille and respond to her cues seamlessly. Like many other stars out there, Guada is very proud and he does everything he can to be noticed both on and off-stage. His groomer, Timo, among others, has remarked that every time he leaves his stall he calls out loudly to the rest of the stable to get a little attention and say hi! Come see Guada and the rest of the team tear it up in the next Odysseo performance near you!